Jeff Emtman opens the door of his freezer and one-by-one removes the contents. 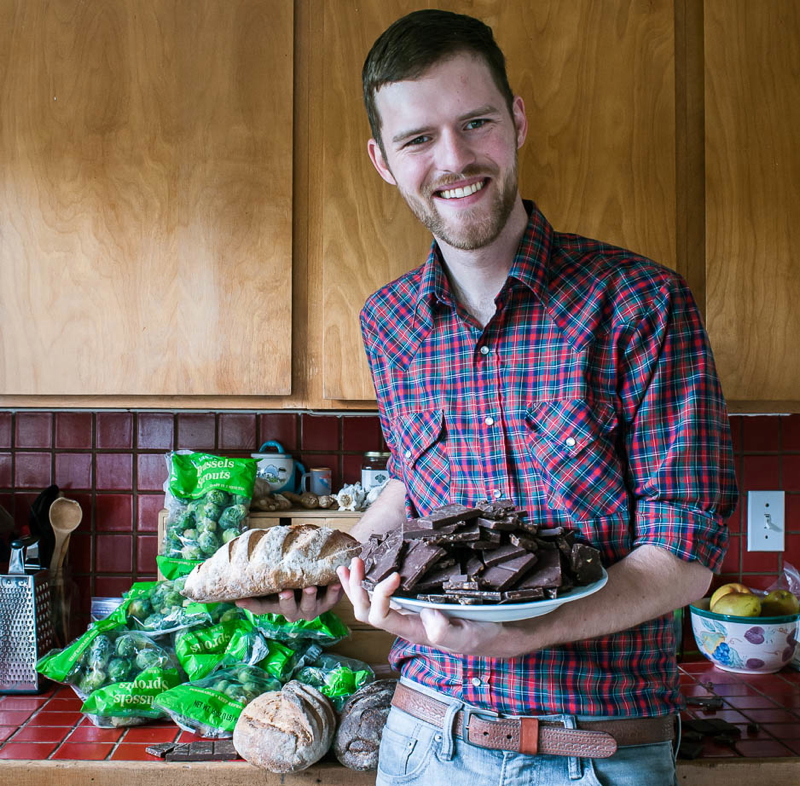 He pulls out several pounds of Brussels sprouts, loaves of artisan bread, cinnamon rolls, three-plus pounds of locally made chocolate. And there’s more. Emtman, a Seattle resident deeply concerned about food waste, acquired his bittersweet collection in dumpsters located on FallingFruit.org, a long underground source for dumpster divers or “freegans” who dine on out-dated, over-stocked or overripe food tossed out by stores, restaurants, and bakeries. Now, the map is no longer a buried treasure. In April, Caleb Phillips and Ethan Welty, FallingFruit’s founders, went public with the global dumpster map, which is just one of several options the site offers, including the location of fruit trees and other foraging opportunities. Recently, the pair has begun speaking at food justice conferences, contacting online freegan communities and handing out stickers, expanding the site’s fan base. Calling it the most extensive and diverse map of its kind, the pair’s ultimate goal is to shed a bright light on the enormous quantity of food that goes to waste–in this country and abroad. Phillips and Welty are raising money to create a FallingFruit mobile app for foragers and divers through Barnraiser.us, a newly launched crowdfunding site specifically designed for food and sustainability projects. They hope to raise $10,000 by the end of May. To create the dumpster map, men spent months combing the Internet for dumpster location information and painstakingly checking each entry before adding it to their site. Their hope is that other freegan sites such as trashwiki.org and freegan.info will embed the FallingFruit map. To date, there are at least 2,500 bins on the map with up to five new ones added daily. Welty estimates that around 500 people are using the site every day and he expects the numbers to rise as summer kicks in. Along with most U.S. cities, map users have entered dumpsters in Antarctica, Jamaica, and even the North and South Pole, says Phillips. Considered an anti-consumerism movement, dumpster diving, bin raiding or “skipping” as it’s known in England, where dumpsters are called skips, is said to have its originated with the Diggers, a group of 1960s artists and activists who lived in San Francisco’s Haight-Ashbury district and distributed rescued food on the streets. Who are today’s divers? Meitar Moscovitz (screen name MayMay), a traveling software programmer, says he lives on the road and depends on FallingFruit for “literal sustenance.” His best find so far was around $100 worth of recently expired cheeses. Is dumpster diving legal? According to Freegan.Info, a popular site for divers, “Dumpster diving is legal in the United States except where prohibited by local regulation.” In other words, legality varies place-by-place. (Here’s a rundown of the law in California, for instance). “Folks should use their own discretion and study the laws where they live,” says Phillips. And when it comes to food safety, most divers avoid meat and dairy, focusing instead on dry and canned goods (often with bent or torn packaging), baked goods and produce they can prepare later. In Winterthur, Switzerland, 29-year-old Mylene Jacquemart came across a “green bin” flush with delicious apples and added it to the FallingFruit map. The apples became a pie and she’s now searching her neighborhood for more “mappable edibles.” The town also collects unsellable food from stores that is placed in a community fridge. “It’s not your classic dumpster, but check out www.restessbar.ch next time you’re in Switzerland,” she says. Founder Phillips, who treasures brown bananas from dumpsters, believes everyone should try “diving” least once to experience a new awareness of what’s in the bins behind their local grocery store. “It’s a compelling thing to do and it changed my life,” he says. Don Rakow, a professor of horticulture at Cornell University believes the locavore movement has shed new light on urban foraging as well as the freegan movement. But more importantly, he says, it has empowered people with limited budgets, giving them more food choices. “They are taking control of local resources rather than relying on governmental largesse,” Rakow explains. While most freegans enjoys the free food, Emtman says he hopes to one day find dumpsters with no food waste in them at all. Wow, this is pretty impressive. I admire their commitment to conserving food. However, how safe is it to eat foods after their expiration? This is a question that gets asked a lot by people new to diving. It certainly was a question that I had when I was getting into it. It surprised me to learn that expiration dates don't really exist for food. The dates on the labels of food are usually "sell by" dates, not "use by" dates. In the case of "use by", the foods are guaranteed to be fresh tasting up until that date...past that, you're on your own. Wow! Wonderful idea and this is pretty impressive. Thumbs up! Don't forget about the extra food you grew but couldn't eat. Eliminate that food waste AND help your nungry neighbors too. You can donate it to a nearby food pantry. Find one at www.AmpleHarvest.org. Local community kitchens like Second Helpings in Indianapolis, DC Central Kitchen in Washington DC.and Campus Kitchens at universities across the US are using perishable items like meat, diary, produce and.prepared goods to serve the needy in our communities. Local food banks and pantries are getting more refrigeration to ensure they can also use produce and dairy. You might also check out these options in your community - donate or volunteer. Those places cannot take items pulled from dumpsters but instead are a great way to keep food from being discarded in the first place. Those of you in cities without these resources check out what other areas are doing and see if you can help establish them in your communities. Second Helpings in Indianapolis currently feeds more than 3,500 people a day without using any purchased food. It's doable!